The Stranger Diaries opens with the beginning of a short story titled The Stranger, by the fictitious R M Holland. 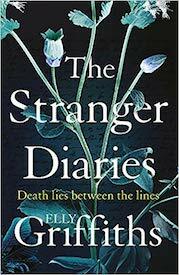 Clare Cassidy, an English teacher at Talgarth High in West Sussex, is discussing this dark, creepy text with her adult creative writing group during October half term. With Halloween approaching, the text is doubly significant because the older part of Talgarth High was Holland's home and it is rumoured to be haunted. Additionally, inspired by this local connection, Clare is writing a book about Holland's life and works. The relaxed atmosphere of the half-term course is shattered by a murder, which seems to have a connection to The Stranger. As the story progresses with further violent events, the links to Holland and The Stranger increase disturbingly. The story is told through the eyes of Clare, her daughter Georgia and DS Harbinder Kaur, who was a pupil at Talgarth High. Clare lives with Georgia and much-loved dog, Herbert. I instantly fell in love with Herbert, described as "a white Hairy Maclary from Donaldson's Dairy". The book is convincingly chilling but lightened at times with a gentle humour. The characters range from the almost coldly professional to the eccentric, with Harbinder possibly the most interesting. Harbinder lives with her parents, mostly enjoying a warm home life as her mother cooks up an endless supply of food and drops constant hints about husbands and children. Harbinder can't bring herself to reveal that she is gay. It would be good to see her reappear in another book. This wonderful, modern Gothic thriller has creepiness in abundance. It is a tremendous read which is perfectly suited for this time of year.